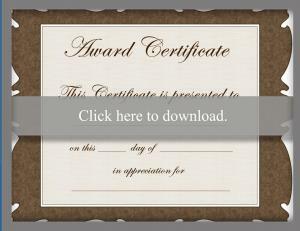 Use free sample award certificates to honor the people in your life for their achievements. A rewards system is a tool used by parents, teachers and employers to get those under them to perform their best. From spelling tests to sales, the accomplishments of others should not go unnoticed. Incorporating a positive rewards system is a proven way to get results in a myriad of situations. However, figuring out what the rewards should be for going above and beyond or reaching a goal can be confusing and costly. Gift certificates to top-performing employees can add up quickly. Giving candy to children is not nutritionally-sound, while small trinkets can be expensive and break. The perfect way to honor successful endeavors is to use award certificates. Adults and children alike get a sense of pride when their achievement is honored and posted for everyone to see. By using free certificates found on the Internet, you cut down on special printing orders. Customize the samples to make them fit your needs without much cost to you. 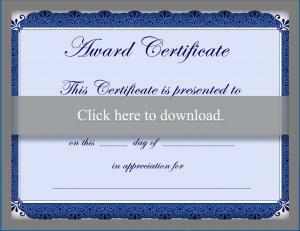 Use these printable award certificates for any occasion. To print, simply click on the image and download. If you need help, you can see the online guide for working with Adobe printables. 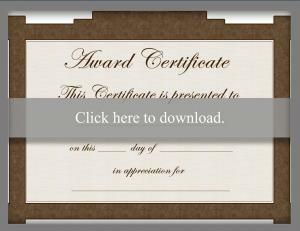 Free Printable Awards Certificates: Choose from several different certificate types, most of which have a special quotation fitting for the particular achievement. Certificate subjects include religious study, honor roll, reading music and a general merit certificate. abcteach Certificates: Find certificates in the teaching extras portion of the website. The educational certificates cover areas from the arts to science to community service. Parents might find the certificate of accomplishment perfect for commemorating events like learning to ride a bike or finishing a project. The birthday awards are perfect for parents and kids to give to one another on their special day. Teachnet.Com Certificates & Memories: Several classroom award certificates are available, such as spelling and student of the month. Other awards include promotion, perfect attendance and achievement that could be used by volunteer organizations or parents at home. Documentic: With 14 different templates to choose from, you are sure to find the one that looks perfect for your needs. Unlike many other free sample award certificates, you can customize this one to print, instead of filling in the information later. GovLeaders.org Free Award Certificate Templates: Scroll to the bottom of the article to find great idea, customer service, quality and high performance unit awards perfect for any workplace recognition program. In fact, there is even a category for romance. Printing off a certificate that tells your partner how much you love him or her or that they are the "world's best" spouse is a great frugal way to show your love. Getting free stuff to use as a reward for kids and adults can help you with your budget and your bank account balance. 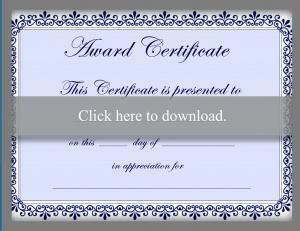 Certificates are a wonderful way to give credit where it is due without racking up your own credit card balance.